After the many attributes of McIntosh were discovered, plant breeders began crossing it with other varieties to enhance its traits. One of the earliest was the Cortland, combined with the Ben Davis variety. 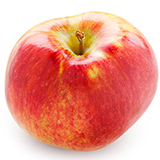 Its flavor is sweet compared to McIntosh, and it has a flush of crimson against a pale yellow background sprinkled with short, dark red stripes and gray-green dots. Cortland is also widely grown across the border in Quebec and Ontario, and it has proven itself to be well-suited to the freezing temperatures experienced around the Great Lakes. Cortland has very white flesh and is an excellent dessert apple. A hint of tartness makes this a great baking variety, used frequently in desserts. A descendent of the McIntosh, this variety is a bit sweeter than its ancestor. Known for its white flesh and excellent flavor.